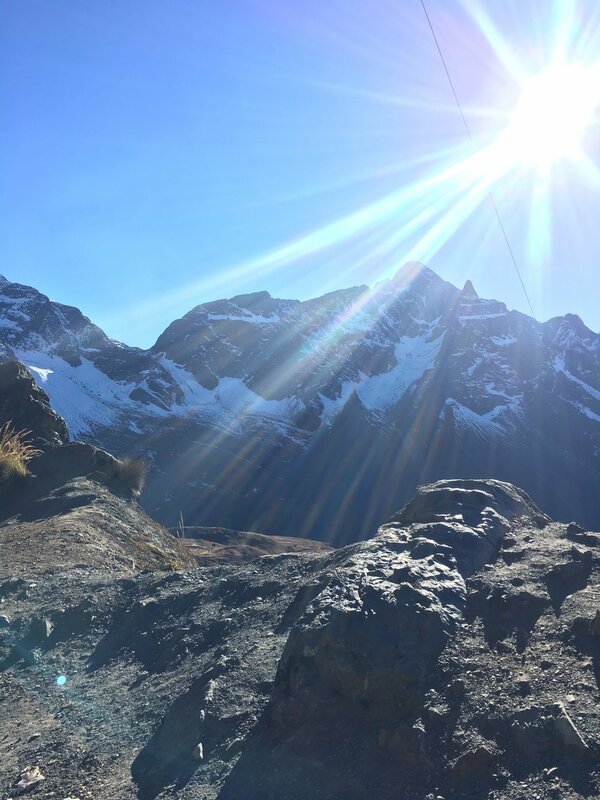 As soon as we stepped off the plane, I felt the altitude hit me like a ton of bricks. Dizziness, lingering headache, and general lethargy but we immediately jumped in a cab and made it to our first hostel. We're staying at the Adventure Brew Hostel B&B, where we will have a private room with an en-suite bathroom, complimentary breakfast buffet, and fast-ish Wifi. We can't check in to our room until 2PM, so we're currently chilling in the lobby, sipping on hot coca tea to help with the altitude acclimation. Fingers crossed that we acclimate quickly! We hung around the hostel for awhile and I may have snuck in a quick nap (or two!) and then we decided to hit the town! Well, the town actually hit us, right in the face. 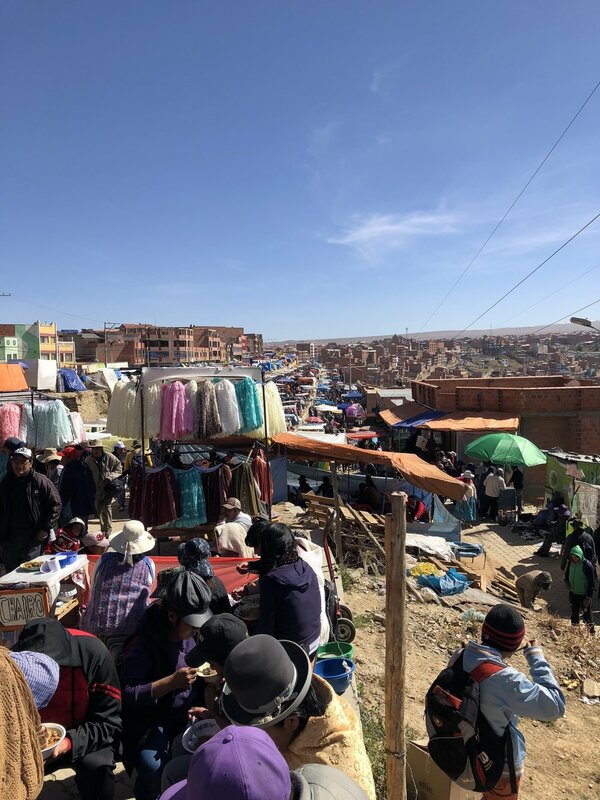 We walked around downtown La Paz for about an hour or so, but we had to stop very frequently because of all the hills and we could hardly breathe. This altitude is no joke. We headed right back to our hotel for more hot coca tea and another nap. We did manage to see some really beautiful sites though! 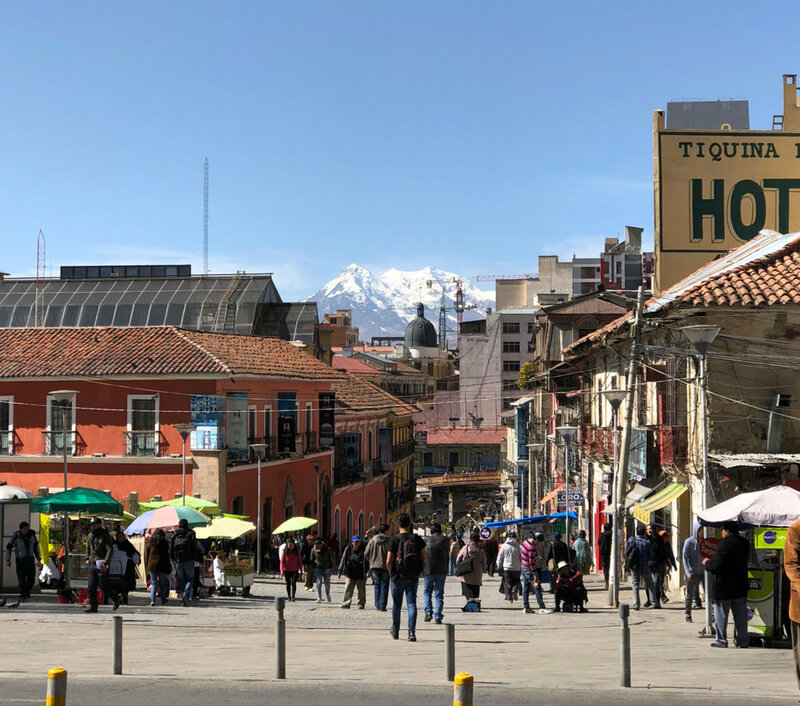 Check out these snow-capped mountains just beyond the bustling La Paz Streets! 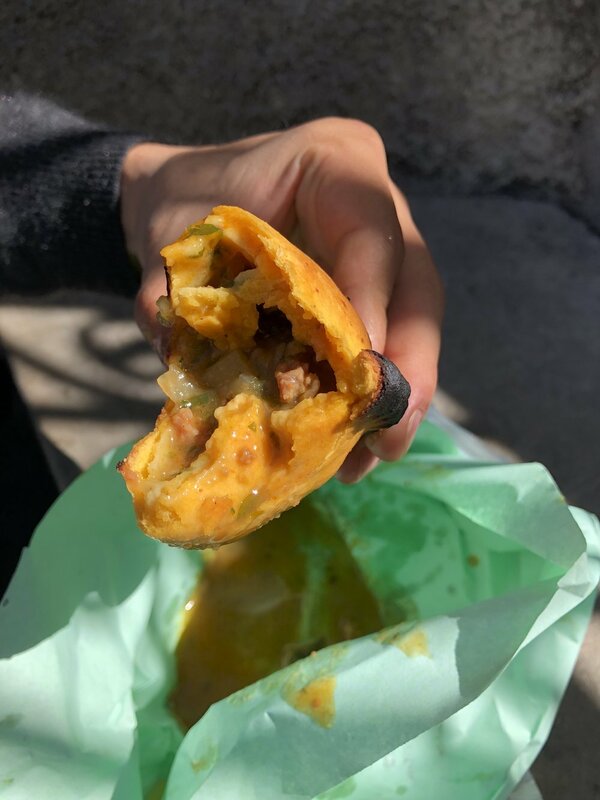 We started to get hungry around 1 PM, so we ventured back out to a Salteñeria, which served one of my new favorite foods of all time: Salteñas. 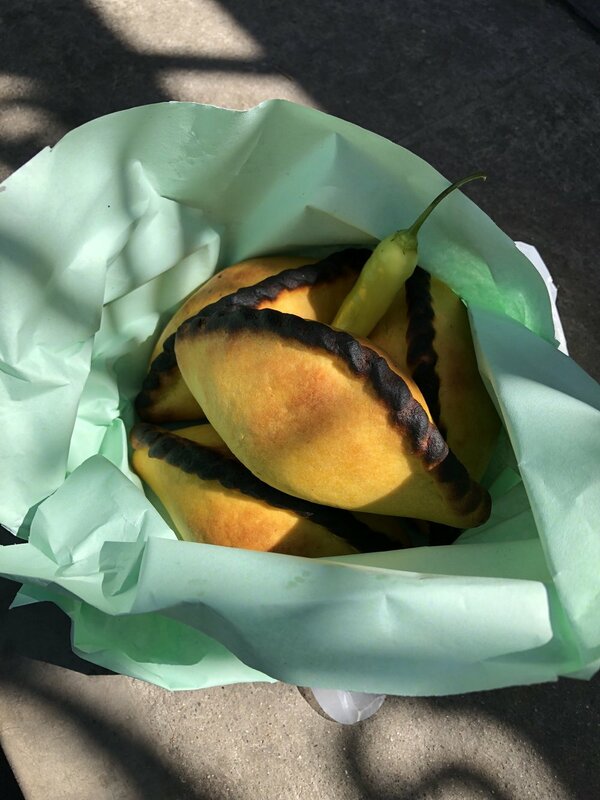 Salteñas are a savory but slightly sweet pastry filled with beef, pork, or chicken and other veggies. 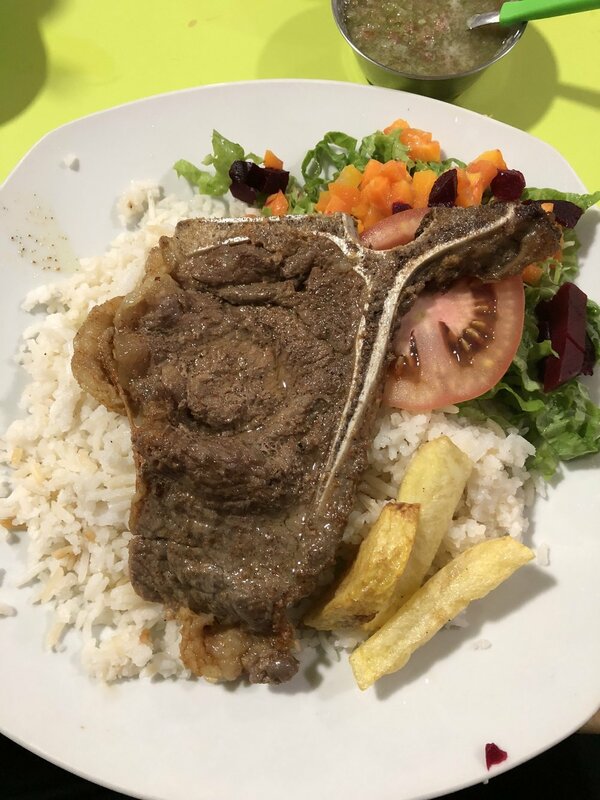 We ordered four beef Salteñas for a little less than $4 and they were ridiculously amazing! I am still thinking about them and I cannot wait to eat them again tomorrow! Definitely messy but they are so amazing! I think they taste similar to a pot pie, but a little sweeter. We were finally able to get checked into our room and guess what we did folks (get your heads out of the gutter!) WE NAPPED. We both had throbbing headaches, serious shortness of breath and dizziness and while we would have loved to go out and walk all over the city, we just couldn't today. 12,000 ft above sea level is high up and we needed time to acclimate. Our room is very cozy with a double bed, warm sheets, and our own ensuite bathroom. After napping, we headed to an all you can eat BBQ dinner that our hostel was hosting. 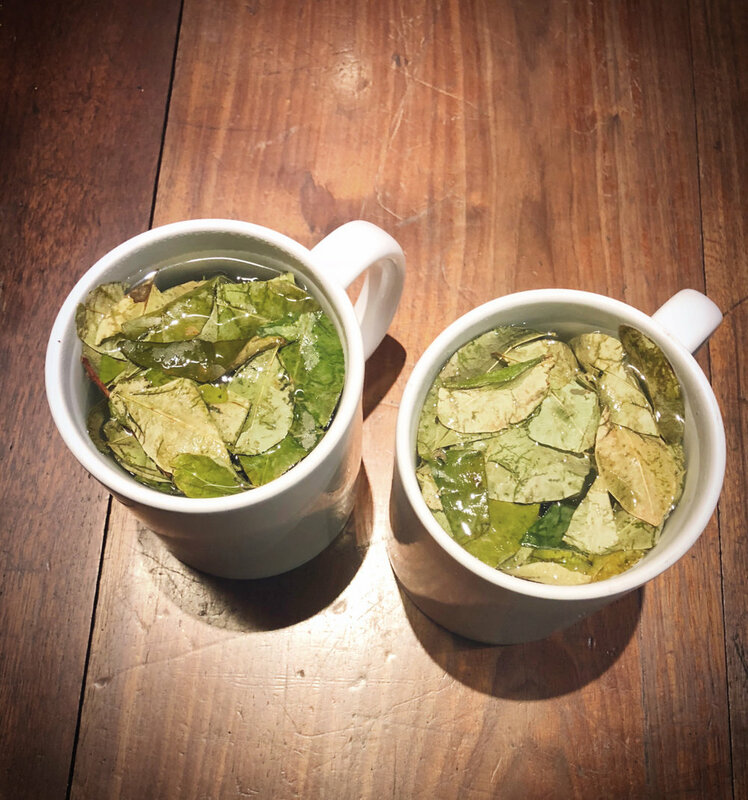 For a little more than $7, we both ate copious amounts of carne asada (steak), chicken wings, sausages, cole slaw, potato salad, and more and this also came with a drink. The food was delicious and it definitely hit the spot. We ate at the very top of the hostel, where they have an outdoor eating space and the views were spectacular! Check out these stunning views! We woke up feeling much better today! The headaches, dizziness, and nausea we were feeling were gone! We started the day with complimentary breakfast that our hostel provides and then set off again to tour the city. 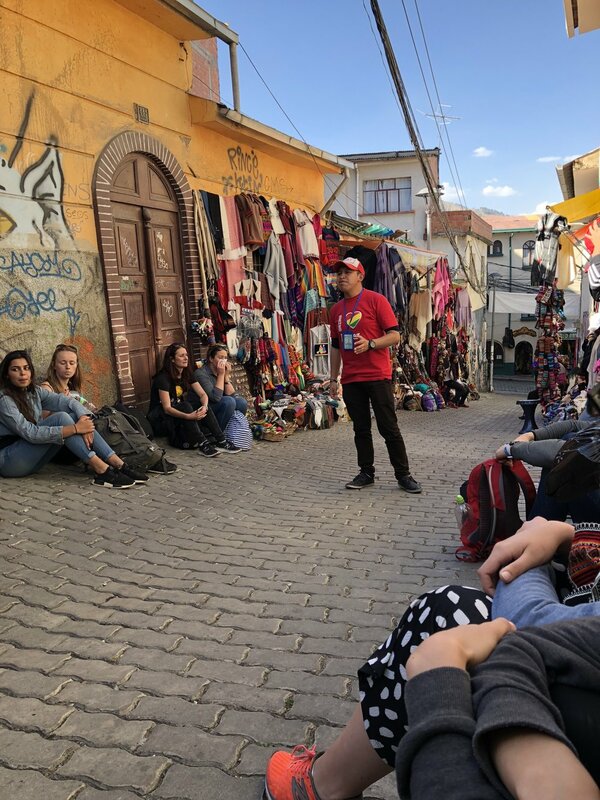 This time, we had a great time walking the streets and getting lost among the locals. We walked to Calle Jaen street, famous for it's colorful buildings and little shops. We continued to walk around the city and the markets, which seemed to be set up on every street. The streets were packed with vendors, shoppers, and cars. It was very congested but such a cool experience. 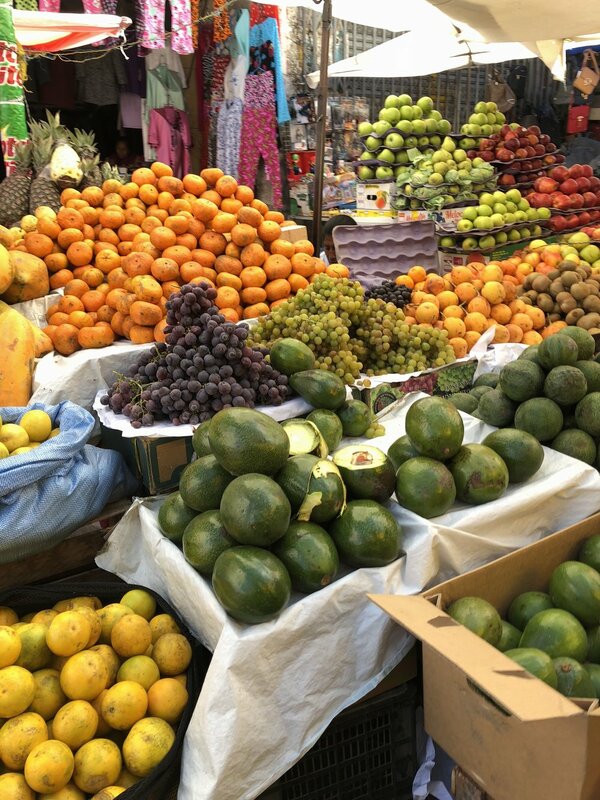 Side note: Visiting local markets is one of our favorite things to do when traveling. 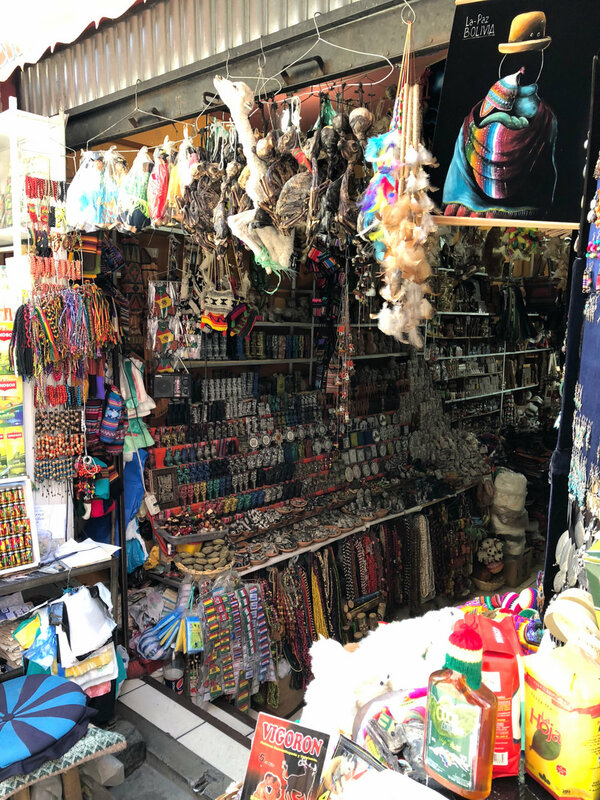 It's a wonderful way to see how locals shop and live their lives. The food markets are my favorites. 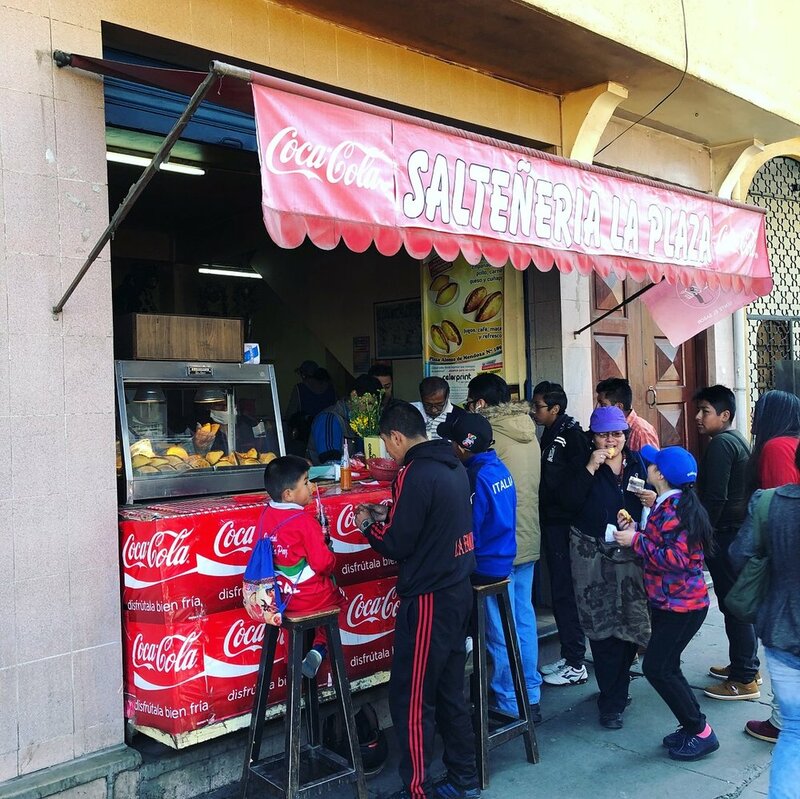 We hit up our favorite Salteñeria again for lunch. They were so stinking busy. 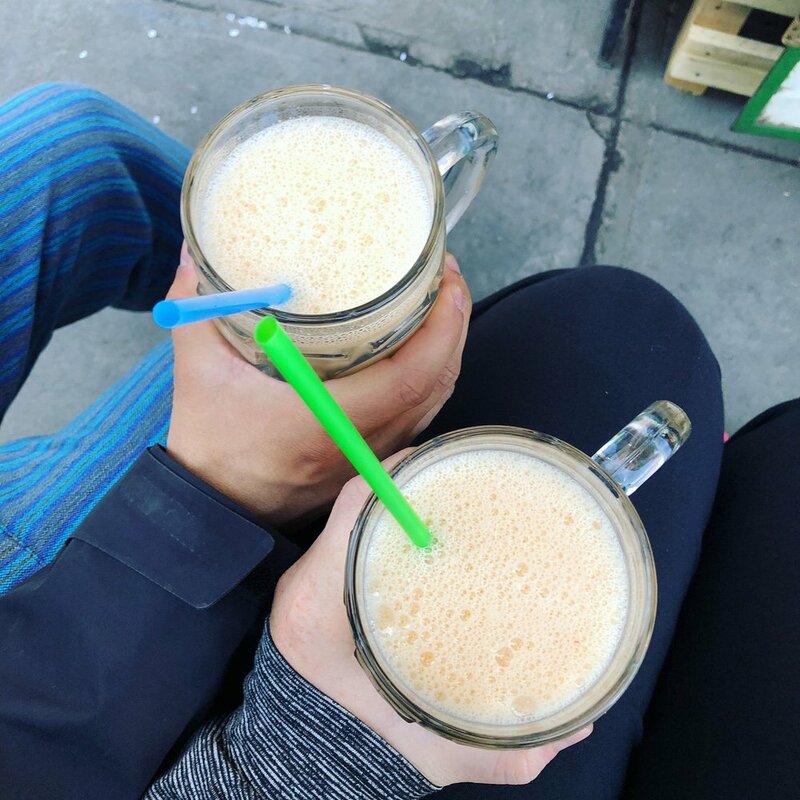 After Salteñas, we had some fresh strawberry and pineapple juice and made our way back to our hostel for a quick nap before our next adventure. Maybe we aren't completely acclimated to the altitude just yet. We hit up Red Cap Walking Tours for a three hour walking tour around the city. 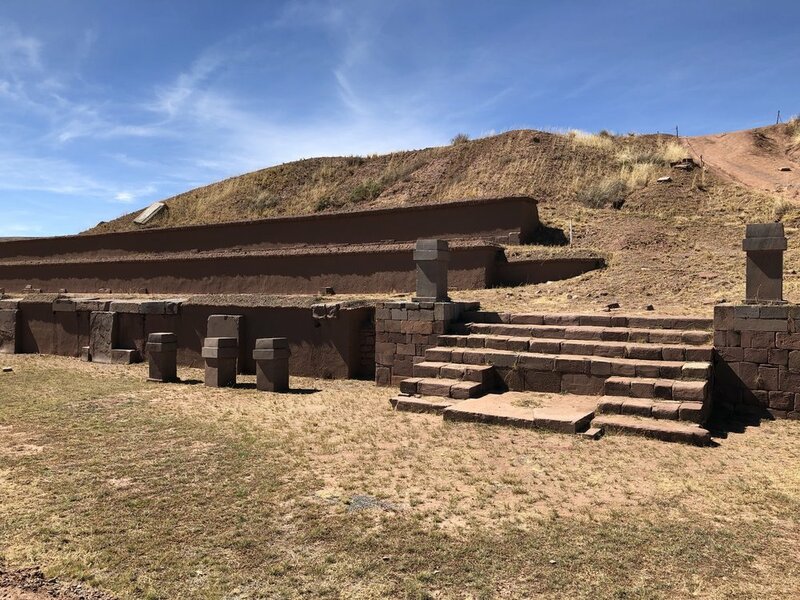 We visited the San Pedro Prison, a prison run by the inmates itself (we did not go inside Mom and Dad, so just take a breath), we also visited the food market, the Witches' Market (we're headed back here at some point soon so I'll give you more details then! ), the main square, and more. 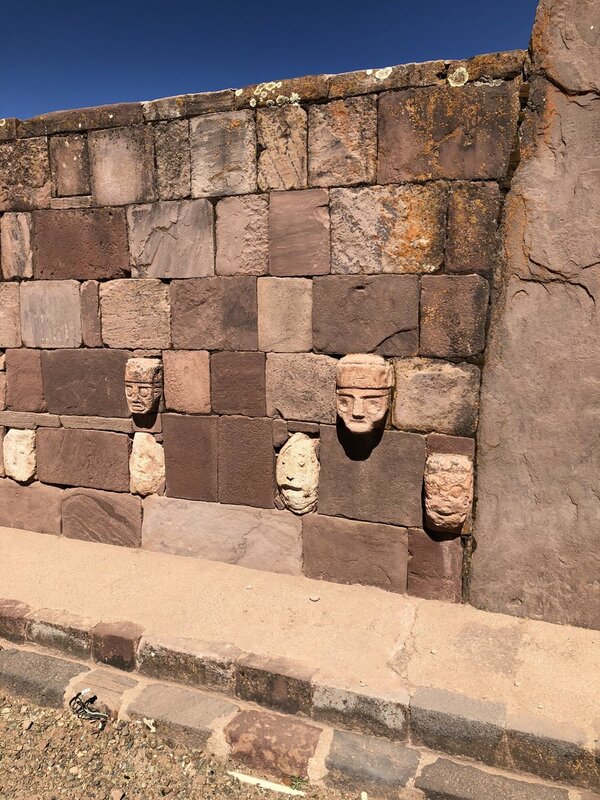 Our guides were super knowledgeable and we learned a lot about Bolivian culture. The tour used to be free, but they recently upped the price to 20 Bolivians (about $3) but it was totally worth it. 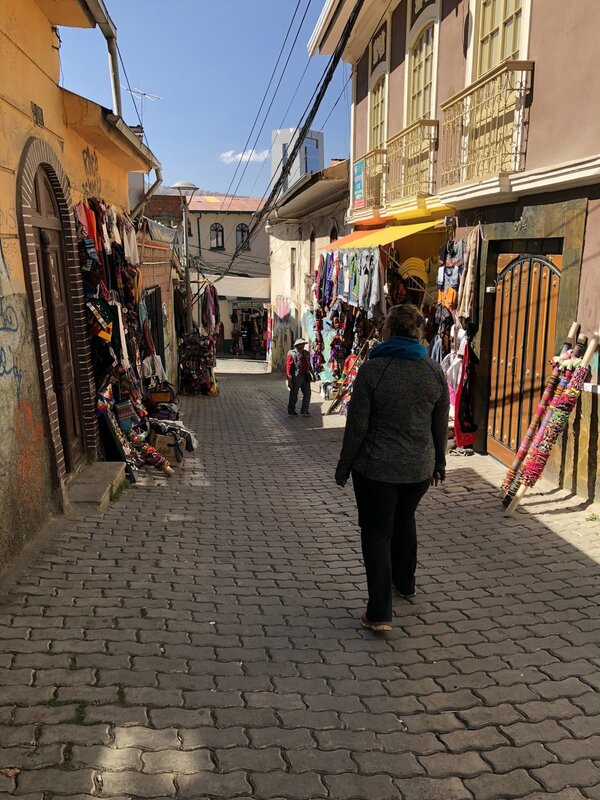 After our tour we walked around the town taking in the sights, sounds, and smells of Saturday evening in Bolivia. What a wonderful place to be. We had dinner at a local restaurant. Nothing fancy, just a cut of pork on a bed of rice on plastic chairs surrounded by locals. 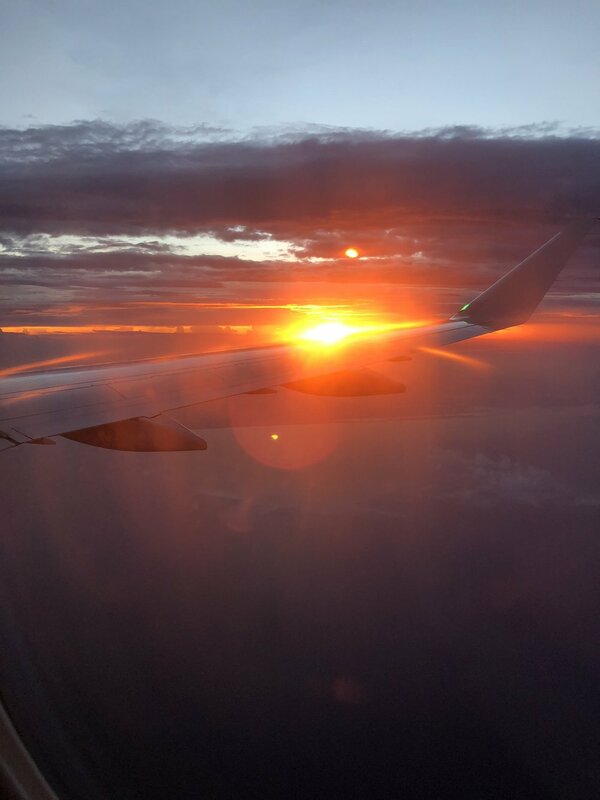 This is what we love about traveling. I woke up today with the worst headache of my life. I'm guessing the altitude is still messing with us because this headache felt like nothing I've ever experienced before. I took some headache meds and went back to sleep. We decided to try breakfast to see if that helped the headache and it did, so we decided to set of our on daily adventure! Side note: I know I've said it before but this altitude is no joke. We've been to pretty high places before (Cusco, Peru and Quito, Ecuador) but we haven't experienced this. It's definitely harder than we thought it would be but we're taking it slow and trying to not push it. 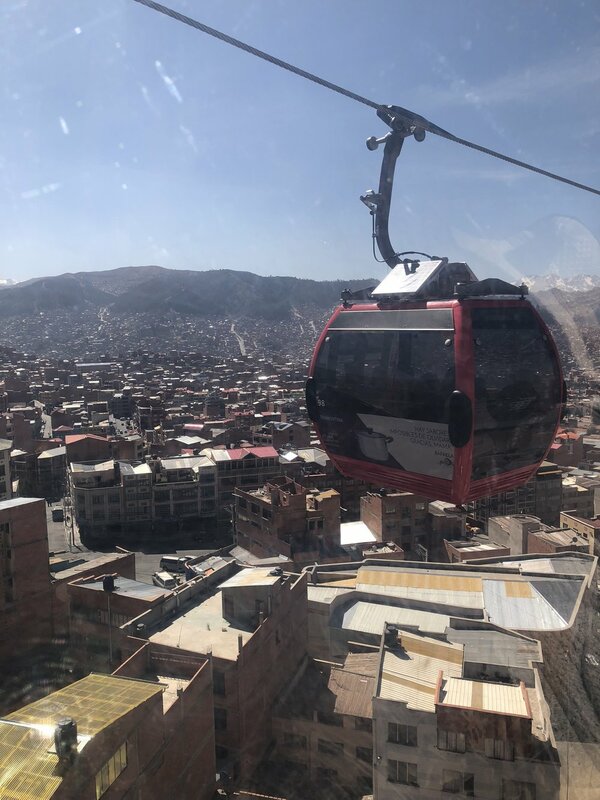 Today's goal was to head to the Teleferico--the cable car built by the Bolivian government to help ease traffic in the city. 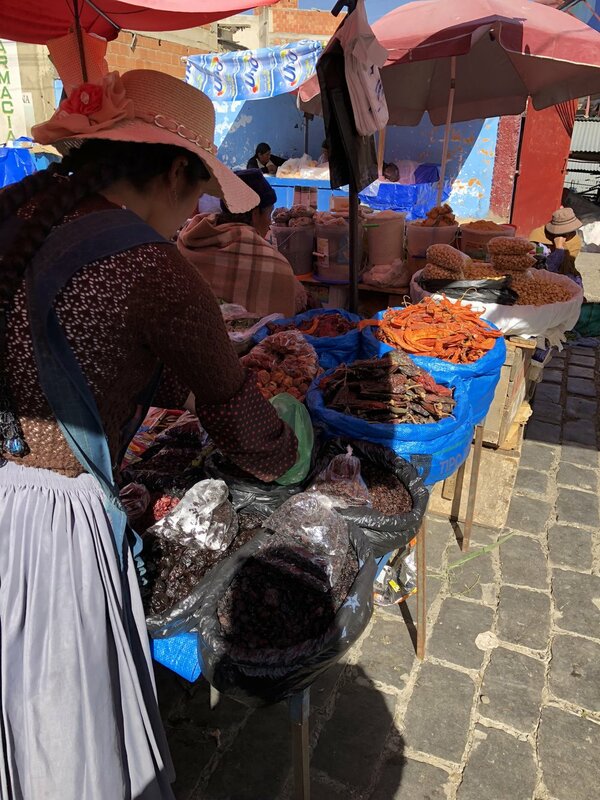 We took the red line all the way up to El Alto and went to their Sunday Market (similar to a flea market). It was jam packed with locals but the views were stunning. Hiding my sheer terror of how fast this Teleferico is going and how high up we are. The market was so crowded! We walked around the market some and then decided to have lunch. We ate in a small stall with tarp walls, plastic benches, and quite a few locals. We had steak and rice and it cost us a little over $1 (total). We also had these delicious cakey treats while at the market. They tasted like pound cake bites and they were delicious! 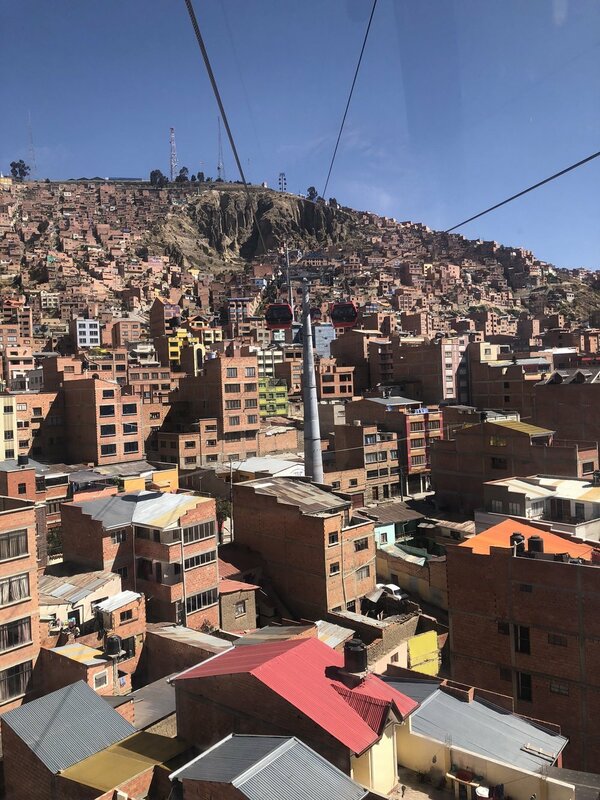 We rode the Teleferico back down to La Paz and then set off walking the city. We walked back to the Witches' Market and touristy section. The Witches' Market is exactly what it sounds like. It's a place where locals can go and buy goods for rituals or offerings. 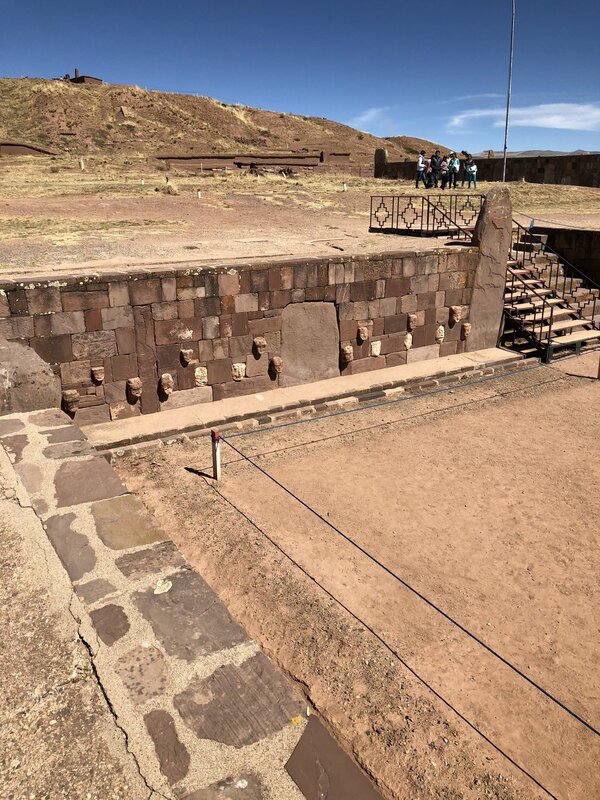 For example, dried baby llama fetuses are a very popular good that can be purchased and given as a sacrifice to Panchamama (Mother Earth) when building a new home. This was a pretty interesting place to walk around. If you look closely, you can see some of the baby llama fetuses hanging from the ceiling. We were told that these llama fetuses are not killed but are extracted when they die from natural causes only. 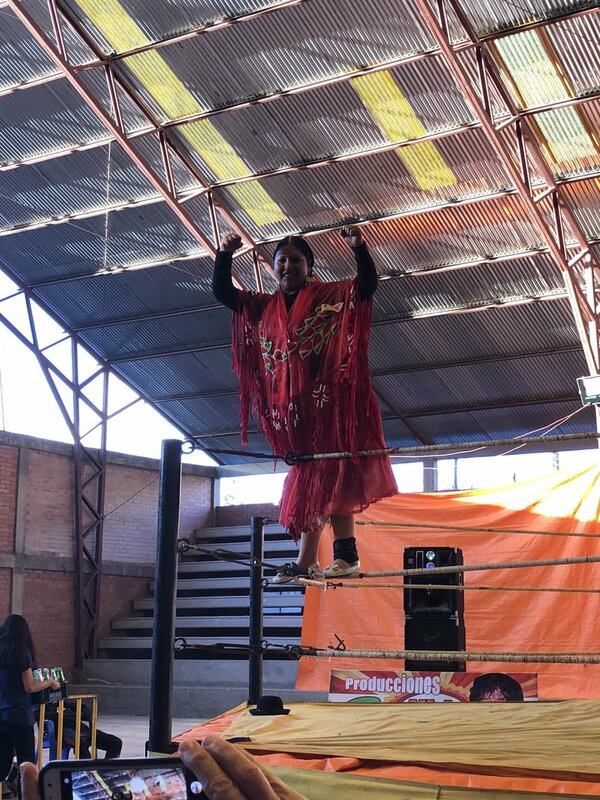 We took a brief respite at a very touristy coffee shop for a flat white and a brownie and then set off back to our hostel for a quick nap before the main event of the evening: Cholita Wrestling. 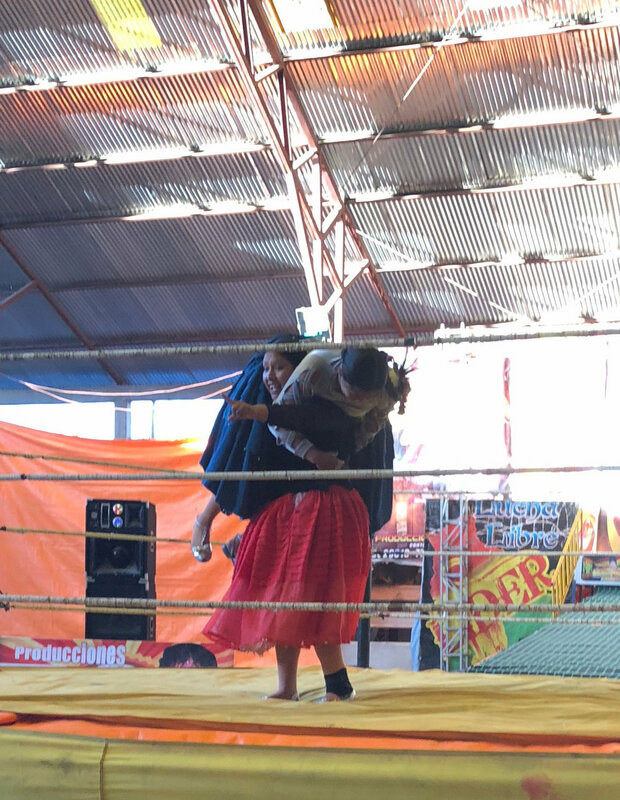 For $13, we took a bus to El Alto to watch Cholitas (indigenous women dressed in traditional bowler hats and layered skirts) wrestle each other. 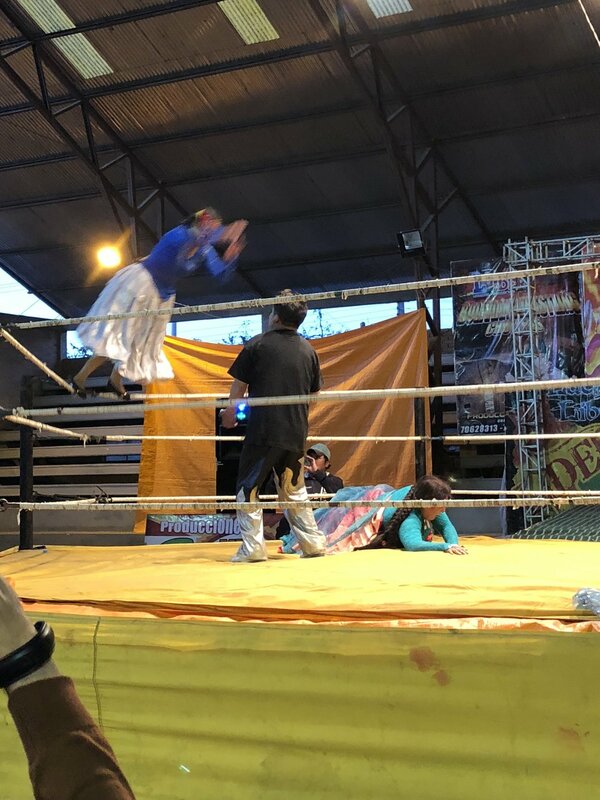 I've never been to a wrestling match, nor do I watch it on TV, so this was a very new experience for me. We were ring-side with popcorn and sodas watching these women beat on each other. I'm still not sure how I feel about it. It was most definitely entertaining, to say the least. Dinner was simple and freaking delicious. 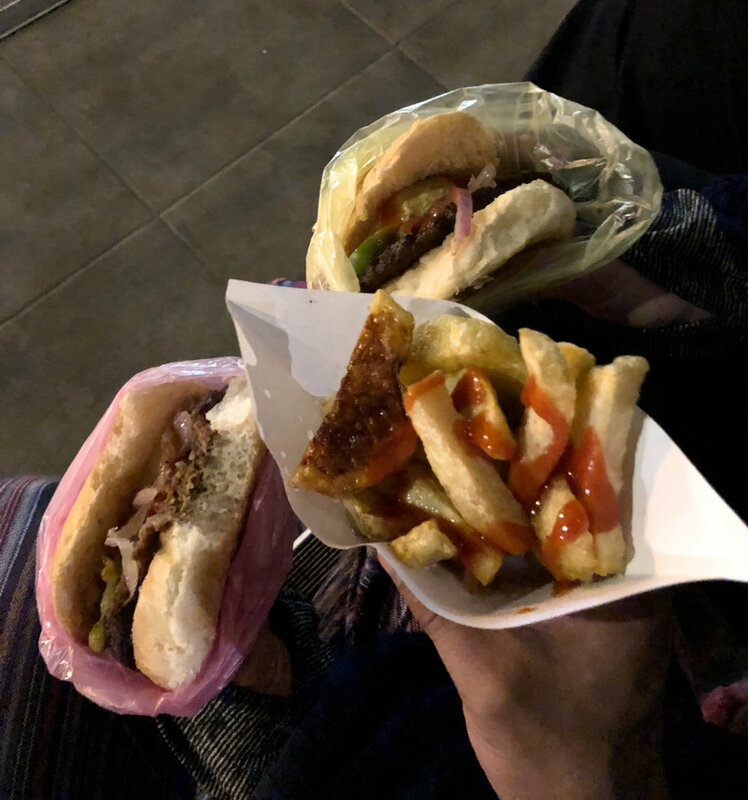 We bought two burgers with sauteed onions, peppers, mayo, and salsa and a side of fries from a truck right by our hostel. It costs us $2 (total) and we ate it on a random set of steps. This is the life y'all. 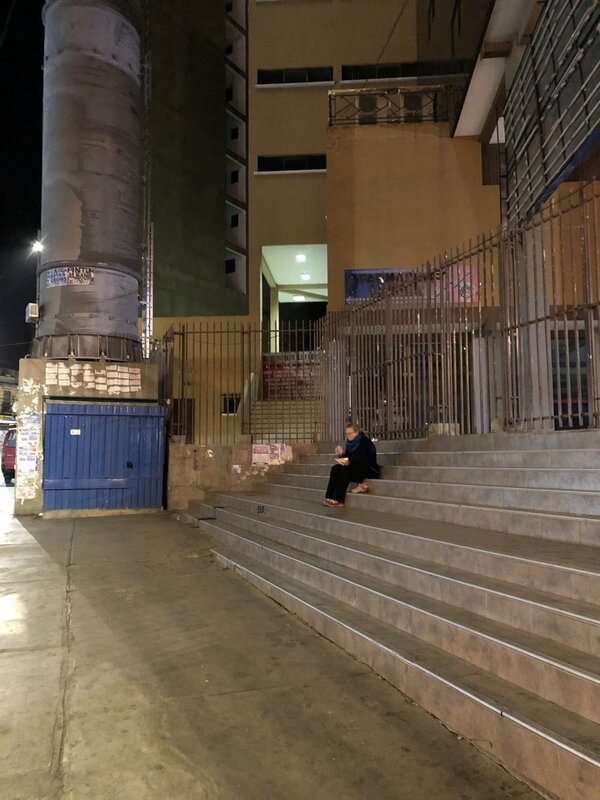 After the game, we decided to take some time to try and book some of the things we want to do while still in Bolivia. 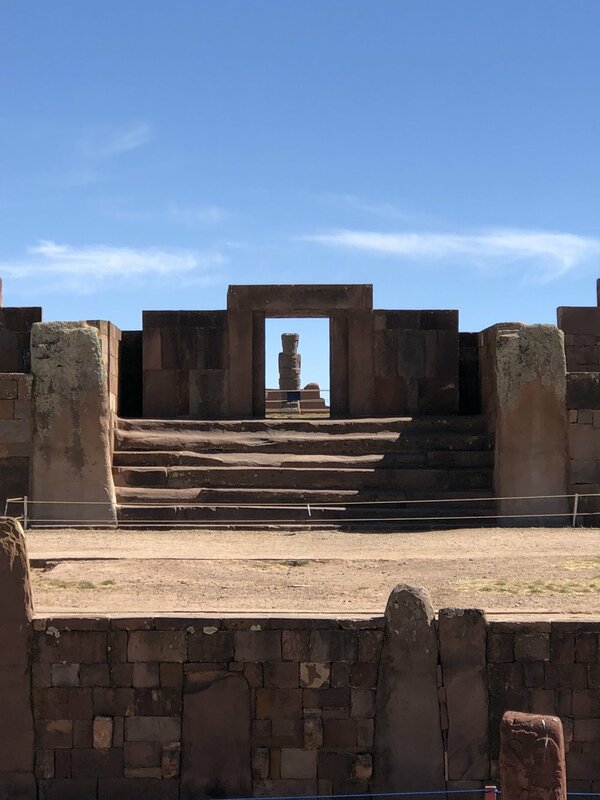 We spoke to a few travel agencies in the area and booked an extra night at our hostel so we can take a day trip to Tiwanku, a UNESCO World Heritage Site. We also booked Michael's Death Road trip (which he's on right now and I'm catching up on blogging). We also did more research into a tour company to take us to Salar de Uyuni and are close to making a decision there. Basically today was a rest and relax day! 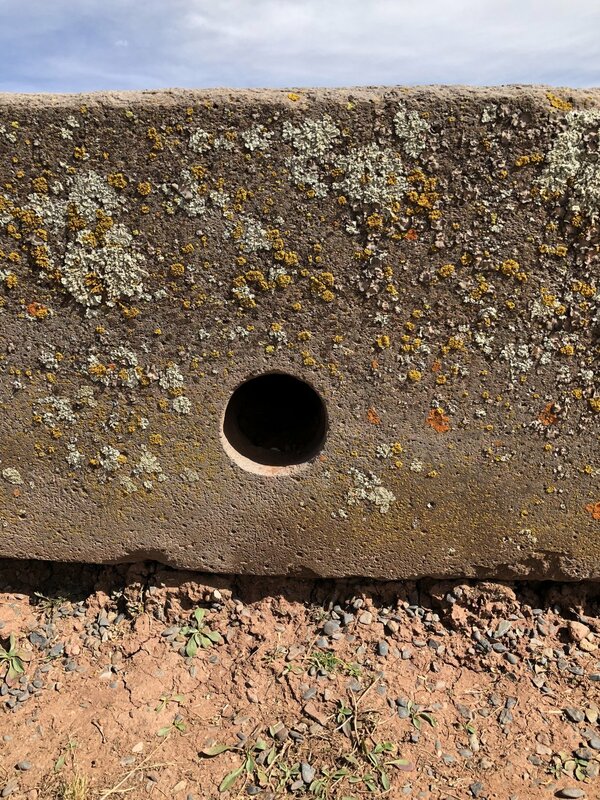 We are still feeling the effects of this altitude. I wake up every day with a terrible headache that generally goes away after I eat breakfast but either way, I'm glad we are able to take it easy some days. Today is Michael's Death Road day! 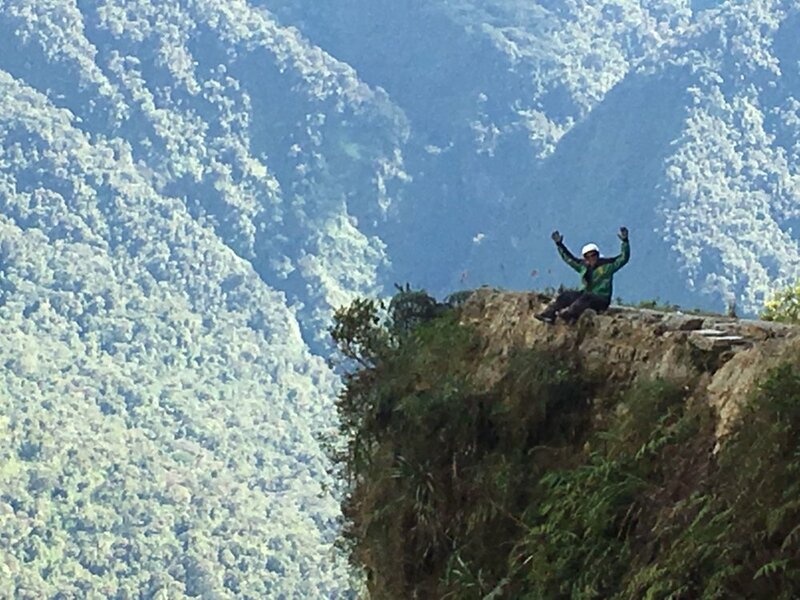 He left at 7:00 AM to meet up with Barracuda, a local company that specializes in doing the Death Road excursion. He tried multiple times to try and convince me to do it with him but NOPE. That is definitely not my thing. So we're doing separate things today. I slept in a bit this morning and then enjoyed the complimentary breakfast offered to us by our hostel. I then set out to the San Francisco Church, built in 1549. I walked around the church and then took a tour with an English speaking guide. 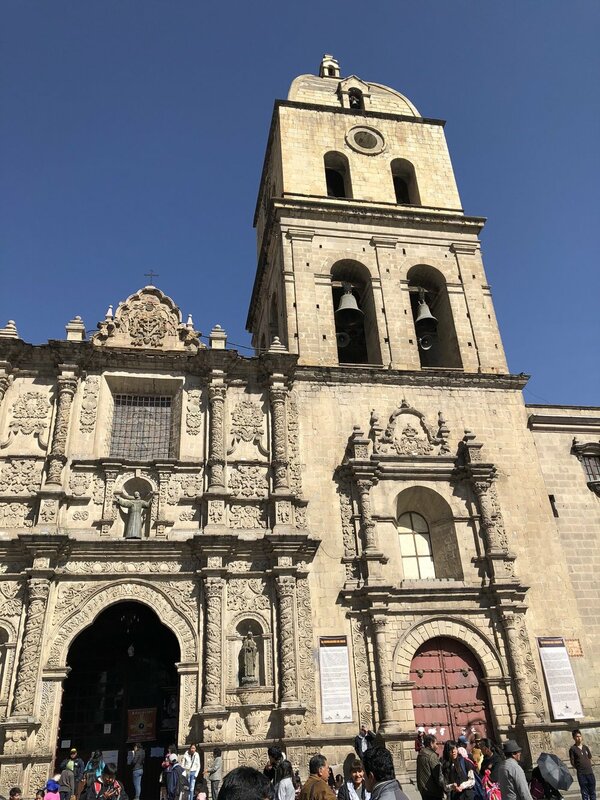 She told me all about how the church was built, the paintings, and important ceremional artifacts used by the church an then we climbed up to the bell tour. A short and very tight climb offering beautiful views of the city. View of La Paz from the bell tower. After my tour of the church, I went to a cafe and caught up on blogging and drank a fair share of flat whites. 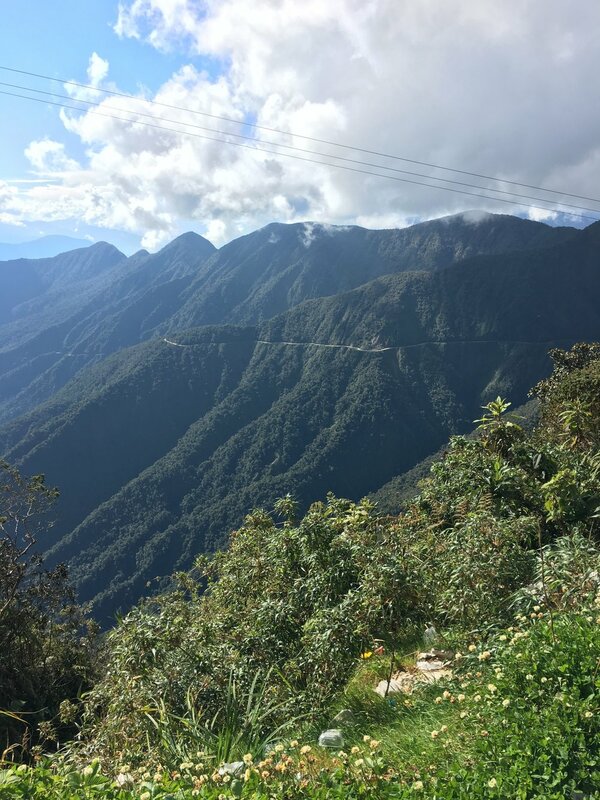 Here are a few photos from Michael's Death Road Adventure! Michael says, "This picture was taken at the very beginning of the bike ride. 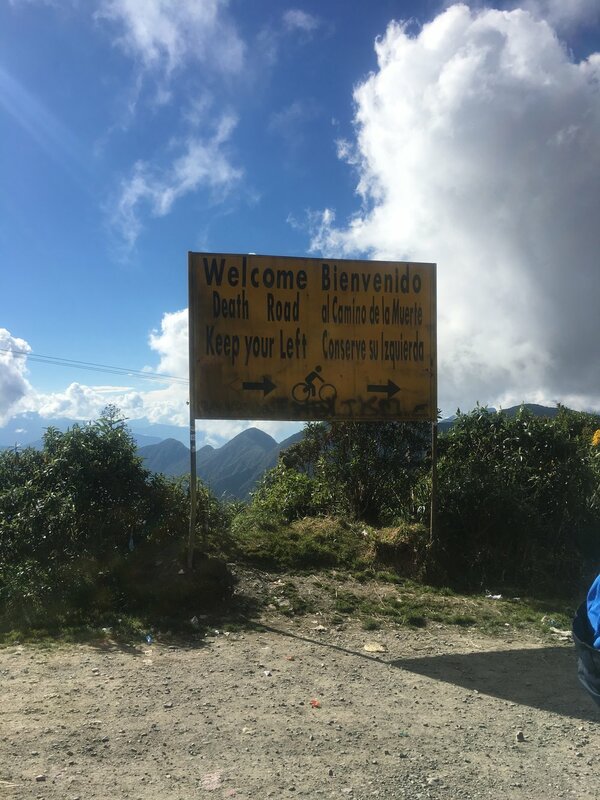 The ride started here at more than 4,000m ( 13,000 ft) above sea level." If you look closely, you can see the road circling around the mountain. A closer view of the Death Road. The reconstruction of the Tiwanku Pyramid. We had a delicious lunch and then headed home with our tour group. We then spent at least two hours solidfying and booking our travel over the next week. 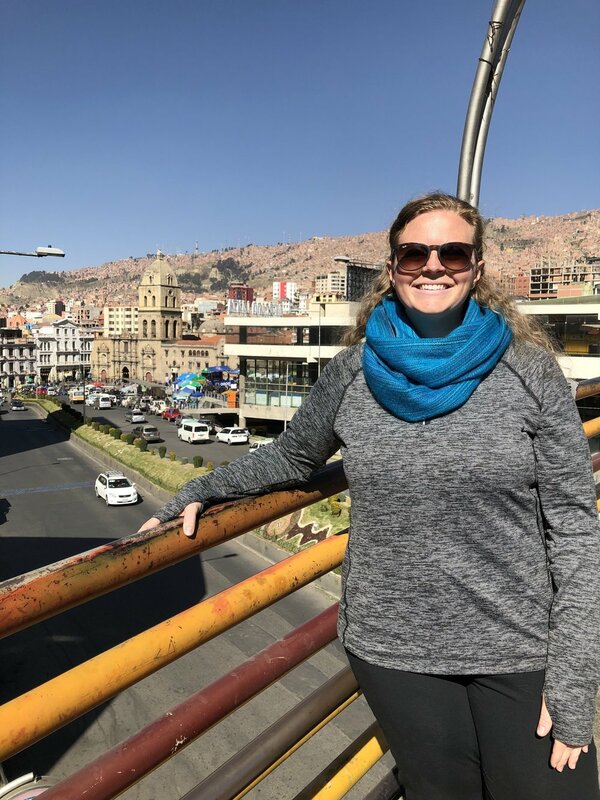 We finally booked a tour company for our Salar de Uyuni trip, our overnight bus from the town of Uyuni to the town of Sucre, and our hostel in Sucre. We woke up a bit later today and enjoyed our last breakfast in our hostel. 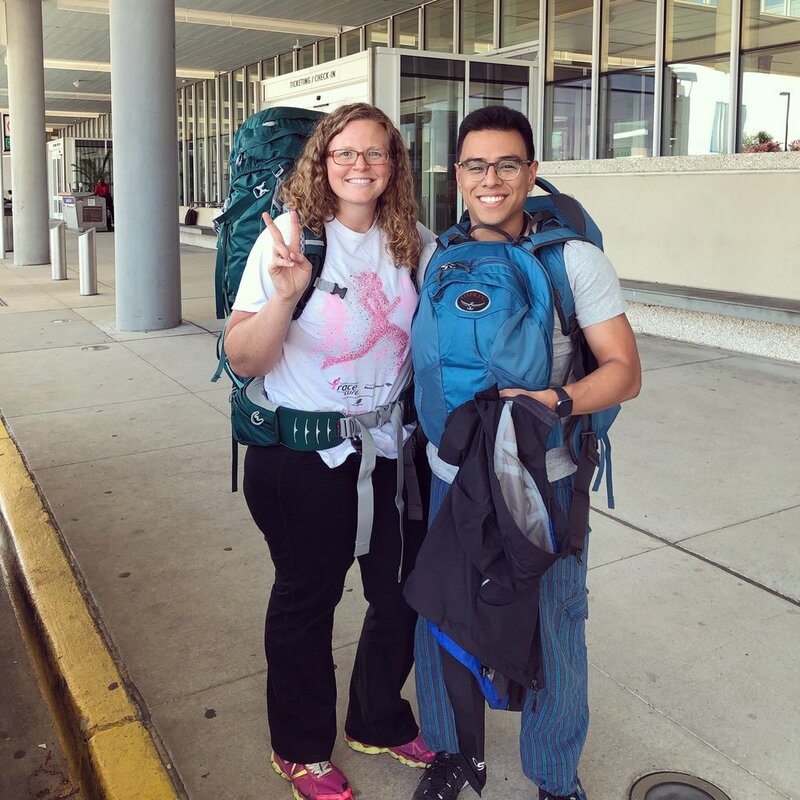 Today we check out of our first hostel and move on to our next adventure! 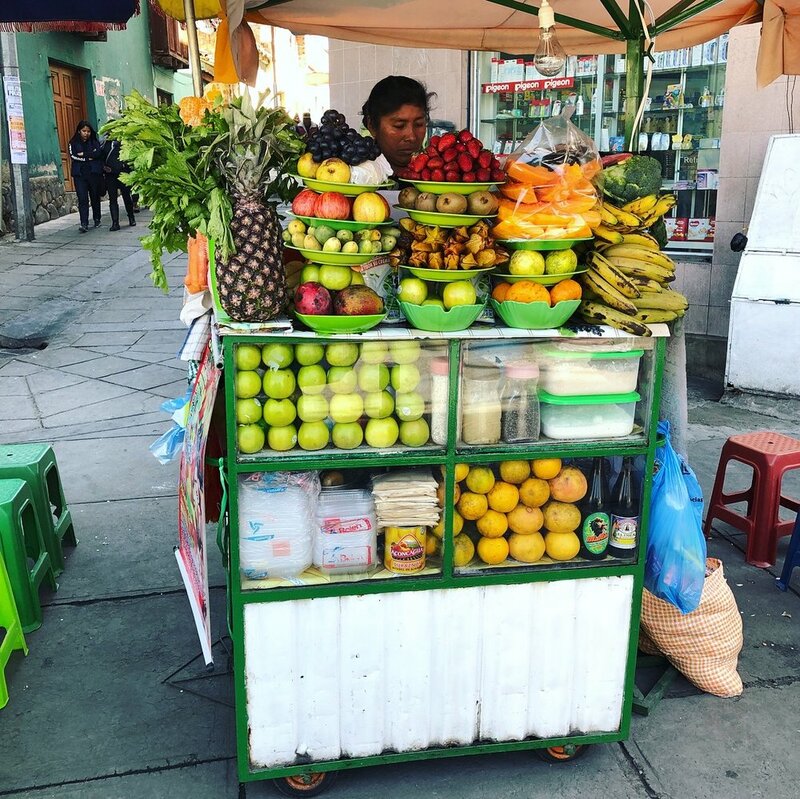 We've spent almost a week in La Paz because there is just so much to do here! But now we're headed for the highlight of our trip, Salar de Uyuni! We will board an overnight bus tonight at 8PM and will arrive in the town of Uyuni around 7:30AM. Our 3 day, 2 night Salar de Uyuni tour then begins the same day around 10AM. This is what we've been looking forward to the most. 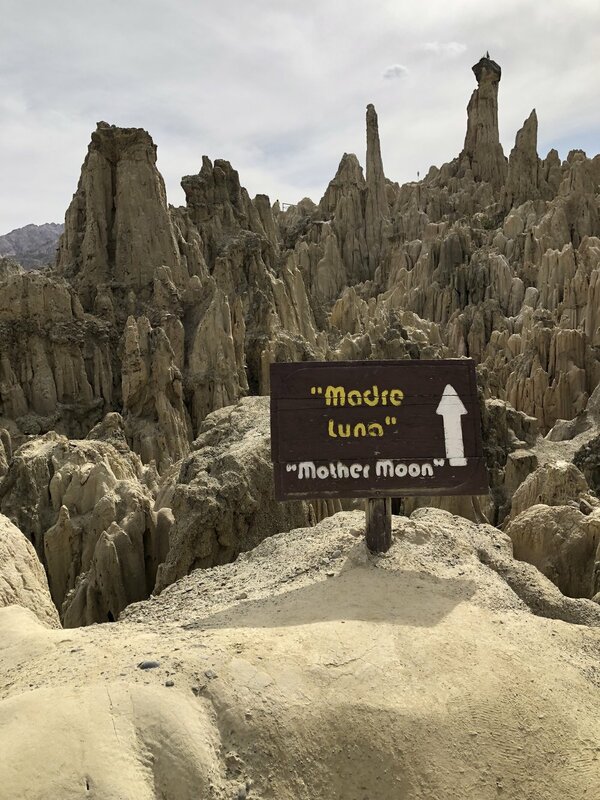 I am so excited to see all of the natural wonders that Salar de Uyuni has to offer! 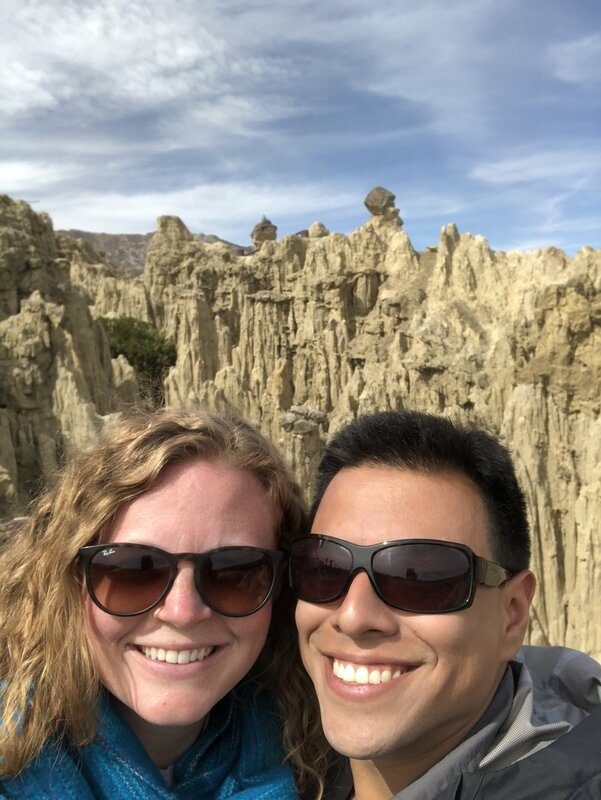 We had a few hours to kill before boarding our night bus, so we decided to head out to Valle de la Luna (Valley of the Moon). A large expansion of rock structures with unique patterns created by erosion. This was such a cool experience! We opted to do the 45 minute trek, where we walked all through the valley. Holding on for dear life. My fear of heights/falling was challenged here. 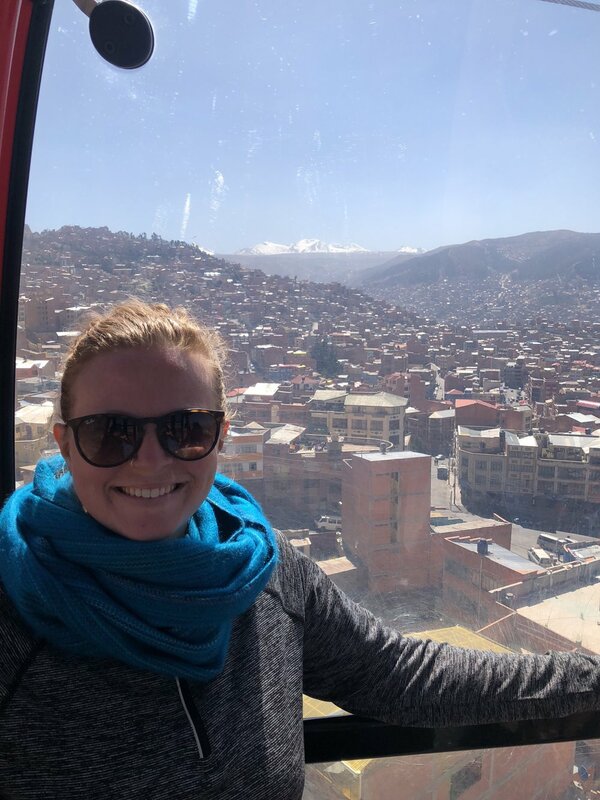 So that's how we spent 6 days in La Paz, Bolivia! I hope you've enjoyed reading about it! Keep an eye out for the next post about our Salar de Uyuni trip!